Prices in EURO'S. All books are complete and in good condition, unless otherwise mentioned. Where no size is given, the book is in 8vo. Orders by e-mail; further instructions will be sent upon receipt. Prijzen in EURO'S. 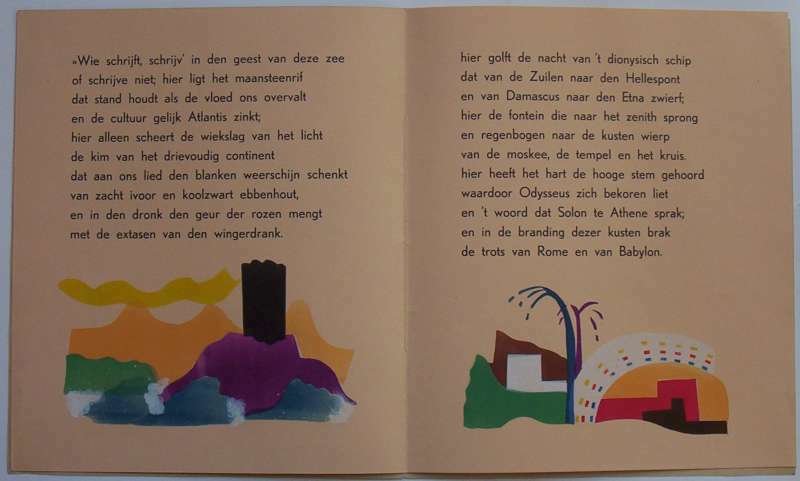 De beschrijvingen in deze catalogus zijn vrij beknopt, maar geven een compleet beeld van de staat waarin het boek verkeert. Bestellen via e-mail. 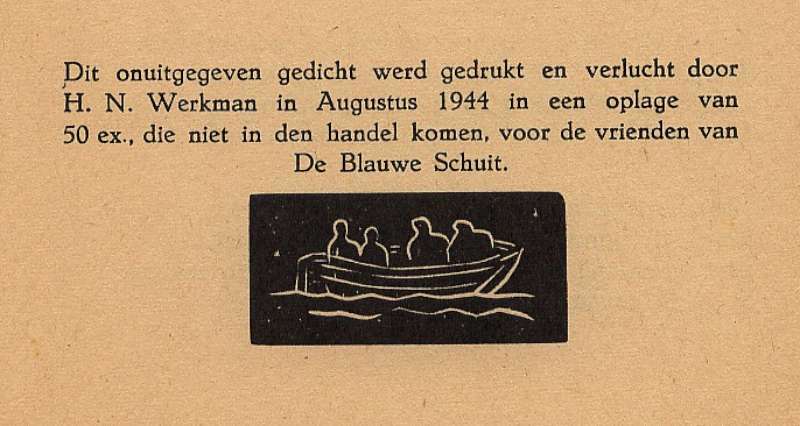 DE BLAUWE SCHUIT - 38 of 40 editions (+ one never distributed) of the famous series De Blauwe Schuit (The Blue Barge), edited by F.R.A. Henkels, A. Buning and A. Zuithoff, all issued without permission of the German occupying forces. 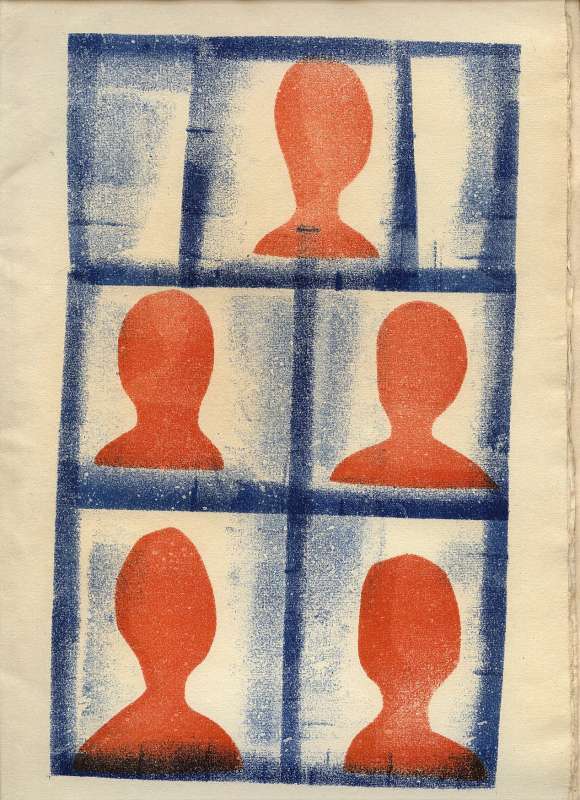 All are decorated with one or more of his so‑called "druksels" or "Hot prints" i.e. 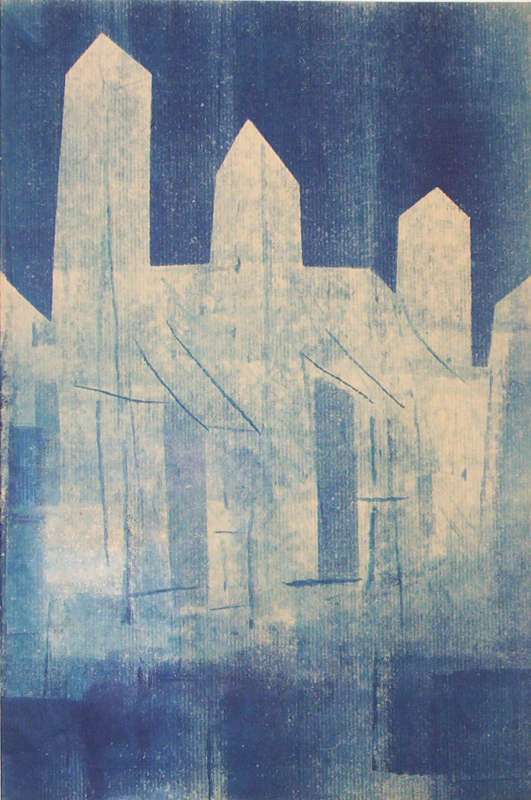 unique hand‑made prints in his special stencil, stamp and roller technique. 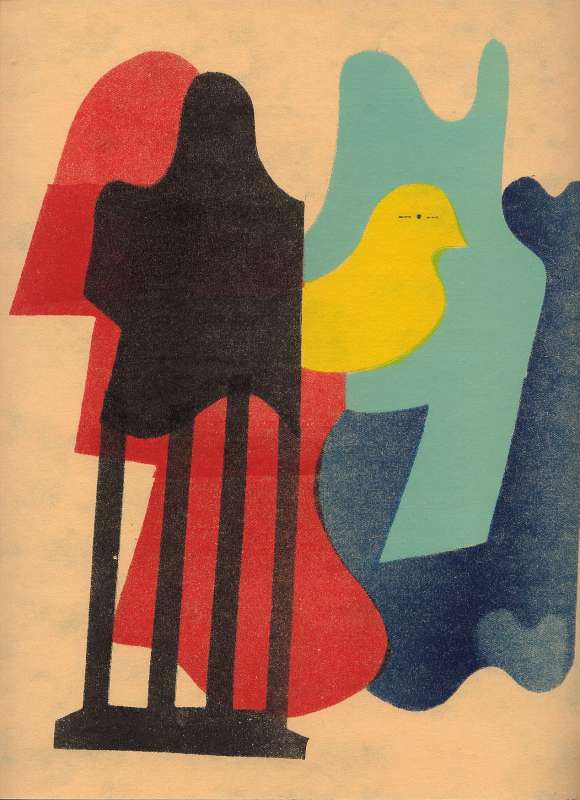 Unlike conventional methods, whereby a sheet of paper is printed in a single operation, Werkman printed each component of a print separately, gradually building up the image, which means that all prints are different and unique, but with the same image! Nos. 1 and 35 in 2 different editions. Unfortunately not in the collection available are the famous “Chassidic Legends”, 2 vols., but a set as described below is very hard to find. I only know one other collection like this, also without the “Chassidic Legends” (which are in this collection added in a facsimile edition)!! 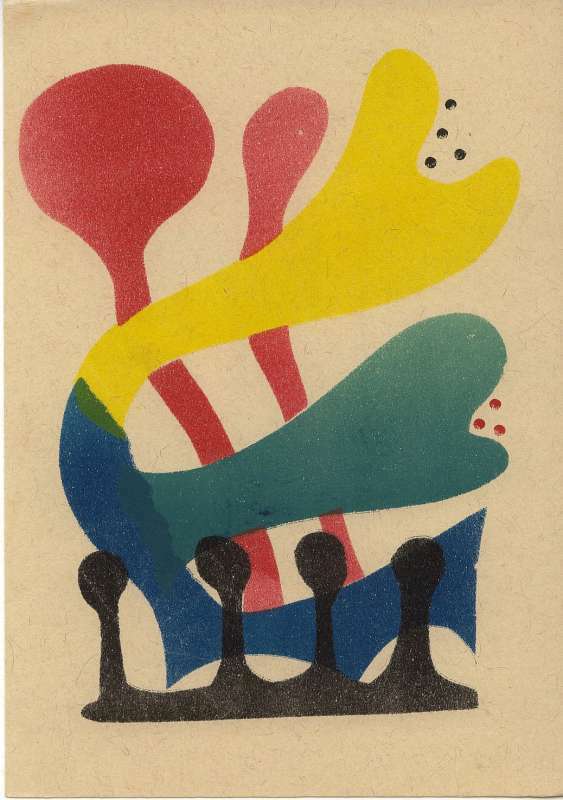 J. Martinet, Hot Printing, catalogus van druksels en … gebruiksdrukwerk…Amsterdam, Stichting H.N. 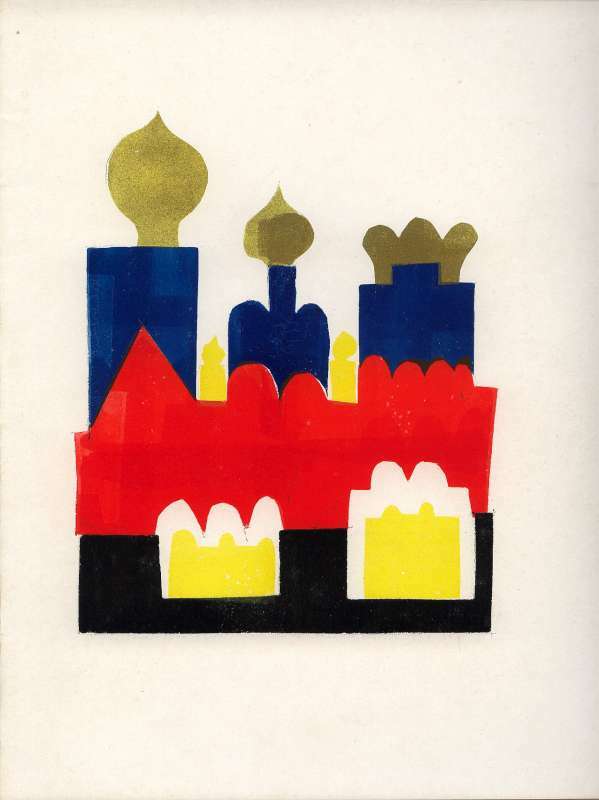 Werkman/Stedelijk Museum, 1963. Serial numbers according to Logboek van De Blauwe Schuit – THE COLLECTION IS IN FINE/VERY FINE CONDITION. 1 NIJHOFF, M. Het jaar 1572. [The year 1572.] With wood engraving by jan wiegers. 1940. 508 x 329 mm. Plano. *1st edition (of 2). ‑ Edition: 100 copies. – Logboek pp. 25; Zuithoff pp. 17; Cat. Hot Printing 40-g1; De Jong 422. 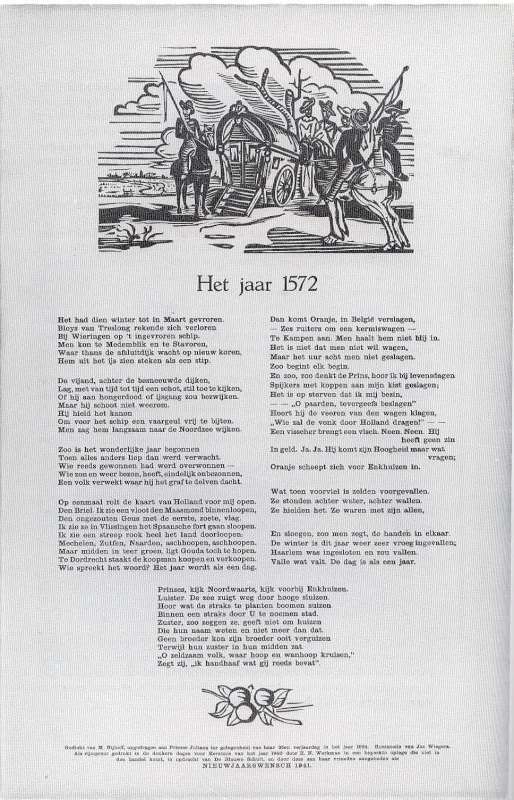 1A NIJHOFF, M. Het jaar 1572. [The year 1572.] With wood engraving by jan wiegers. 1941. 508 x 329 mm. Plano. * 2nd edition (of 2). ‑ Edition: 100 copies. – Logboek pp. 25; Zuithoff pp. 17; Cat. Hot Printing 40-g1; De Jong 423. 2 BUBER, Martin. Die Predigt des neuen Jahres. 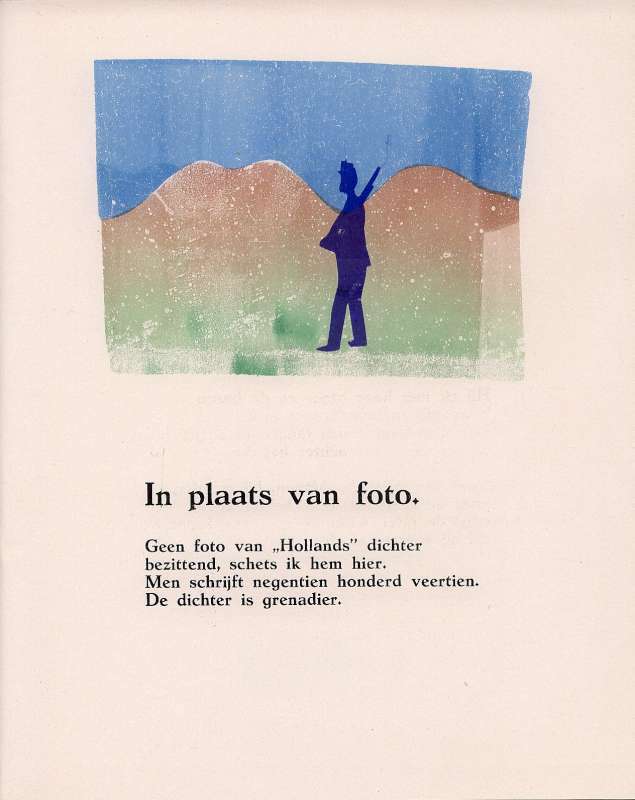 [Met "Korte toelichting bij tekst en omslag" door (note concerning text and cover by) f.r.a. henkels, 4 pp.]. 1941. 370 x 245 mm. 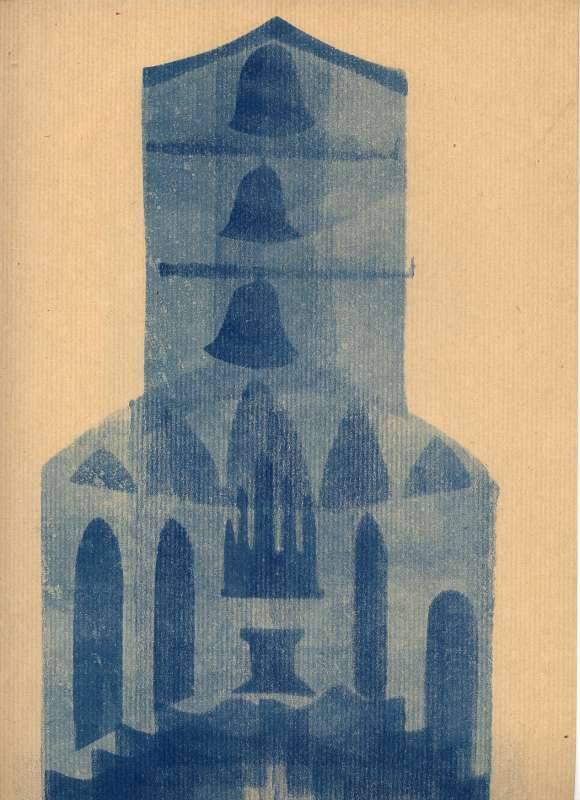 With "druksel" in blue on front cover. 4, 4, (4) pp. * Edition: 60 copies. – Logboek pp. 25; Zuithoff pp. 35; Cat. Hot Printing 41-g1; De Jong 675. 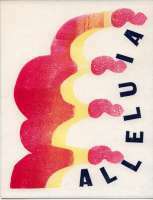 3 ALLELUIA. [Old Dutch Easter song.) 1941. 249 x 191 mm. With "druksel" in 5 colours on front cover and in 2 colours on pp. 1, 2 and 3 inside. 4, 4 pp. * Edition: 60 copies. – Text printed in blue. – Logboek pp. 26; Zuithoff pp. 35; Cat. Hot Printing 41-g2; De Jong 35. 4 HALEVI, Jehuda. Sabbatsgesänge. [Uitgezocht en toegelicht door (selected and with note by) f.r.a. henkels, 4 pp.]. 1941. 365 x 245 mm. With "druksel" in blue on front cover and in yellow and red on back cover. 4, 8 pp. * Edition: 60 copies. – Logboek pp. 26; Zuithoff pp. 35; Cat. Hot Printing 41-g3; De Jong 734. 5 PÉGUY, Charles. Prière pour nous autres charnels. 1941. 206 x 151 mm. 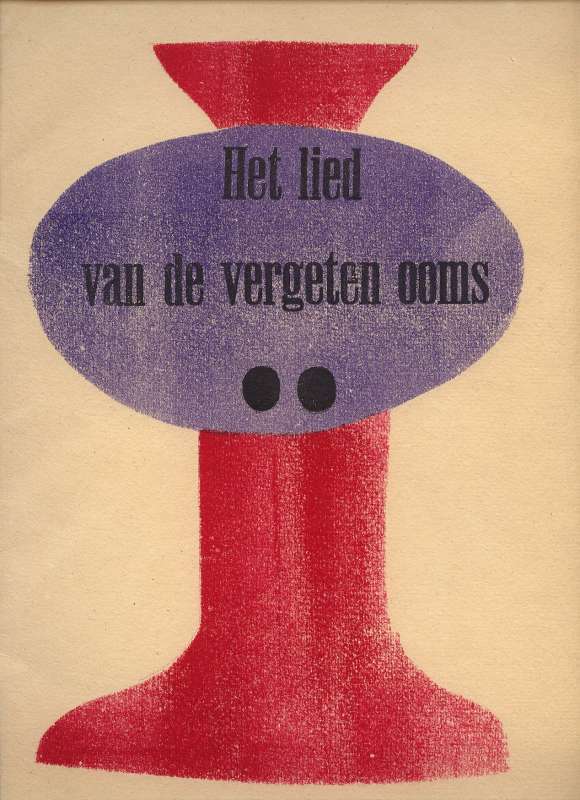 With "druksel" in 5 colours on front cover. 4, 4 pp. * Edition: 90 copies. – Logboek pp. 27; Zuithoff pp. 36; Cat. Hot Printing 41-g4; De Jong 676. 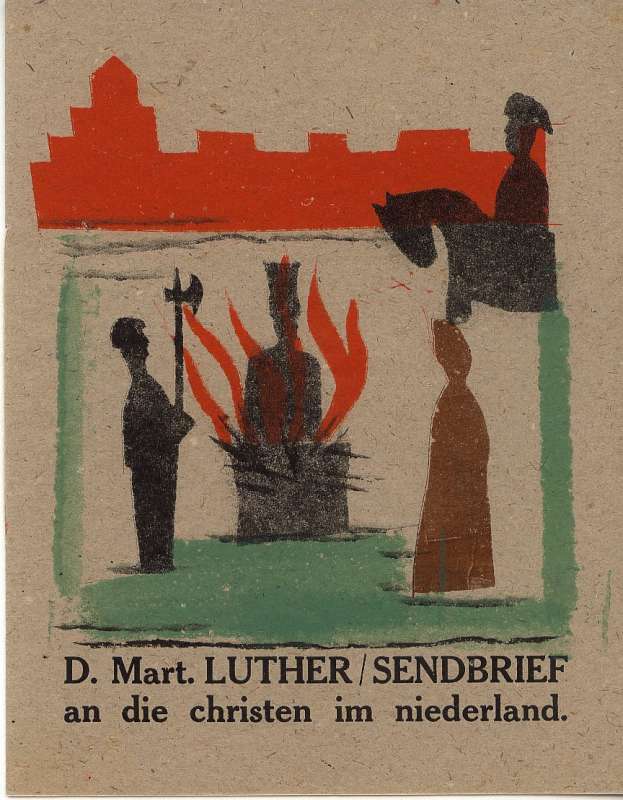 6 LUTHER, M. Sendbrief an die Christen im Niederland. 1941. 188 x 145 mm. With "druksel" in 4 colours on front cover. 4, 4 pp. * Edition: 90 copies. – Logboek pp. 27; Zuithoff pp. 36; Cat. Hot Printing 41-g5; De Jong 524. 7 SOLOVJEFF, Wladimir. Een moscovitische legende. [A Moscovite Legend.] [Bewerkt en met "Aanteekening" door (translated and with note by) f.r.a. henkels]. 1941. 327 x 250 mm. With "druksel" in 5 colours on front cover and 3 "druksels" in 2 colours on the inside of the front cover and back cover and one in red on pp. 2. 4, 12 pp. * Edition: 120 copies. – Logboek pp. 28; Zuithoff pp. 36; Cat. Hot Printing 41-g7; De Jong 578. 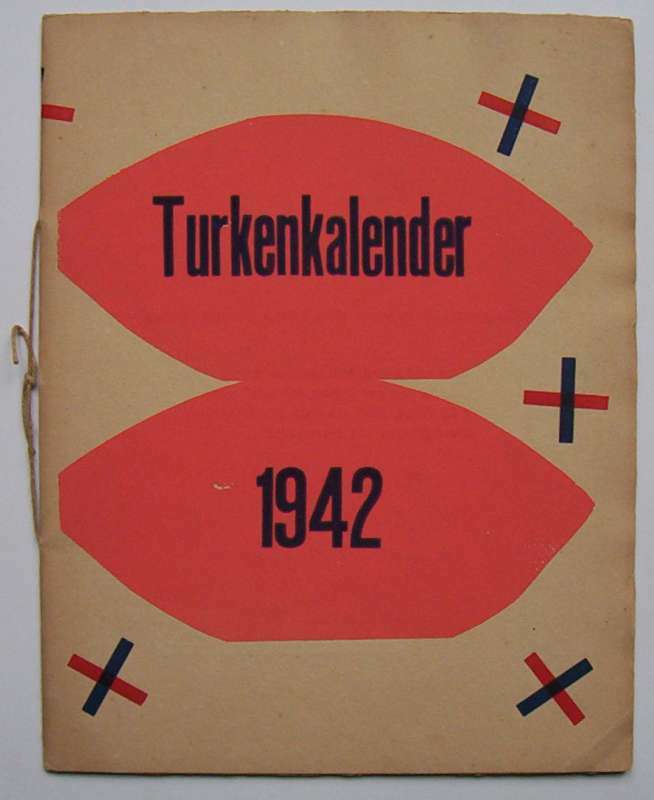 8 TURKENKALENDER 1942. 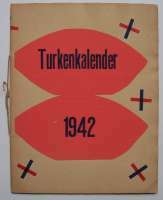 ['Turk' Calendar.] [Samengesteld door (edited by) adriana buning]. 1941. 327 x 250 mm. With "druksel" in 2 colours on both sides cover, 12 calendar‑sheets with "druksels" in various colours and a centrefold in 5 colours. 4, 28 pp. * Edition: 120  copies. – Logboek pp. 29; Zuithoff pp. 39; Cat. Hot Printing 41-g9; De Jong 819. 9 HENKELS, F.R.A. Gesprek. [Conversation.] 1942. 317 x 222 mm. 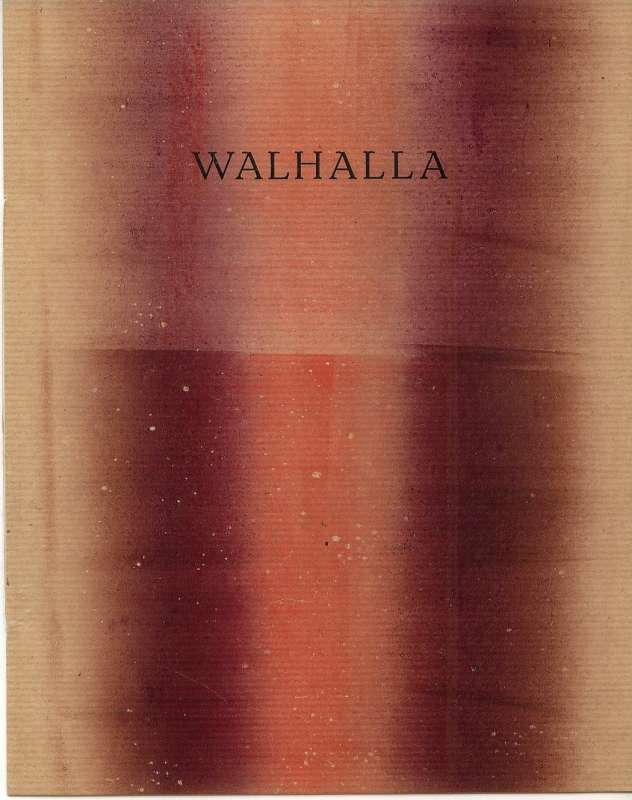 With "druksel" in 5 colours on front cover, inside cover and title page. 4, 4 pp. * Edition: 100 [ca. 120] copies. 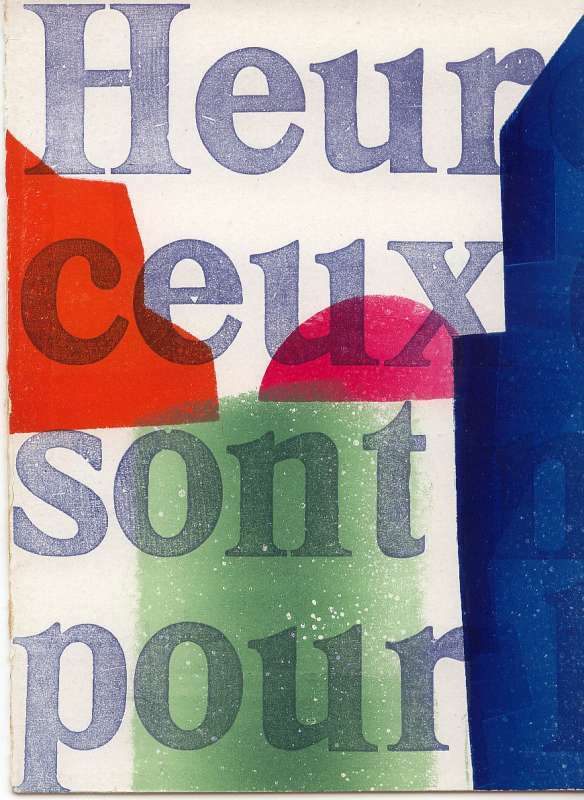 – Text printed in 5 colours. – Logboek pp. 30; Zuithoff pp. 39; Cat. Hot Printing 42-g2; De Jong 304. 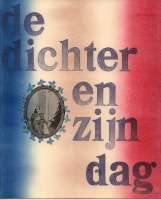 10 NIJHOFF, M. Bij het graf van den Nederlandschen onbekenden soldaat gevallen in de Meidagen 1940. 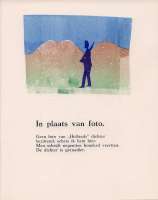 [Tribute to the grave of a Dutch unknown soldier died in May 1940.] 1942. 243 x 187 mm. With "druksel" in 7 colours on front cover and in 2 colours inside cover. 4, 4 pp. * Edition: 100 [ca. 150] copies. – Logboek pp. 31; Zuithoff pp. 41; Cat. Hot Printing 42-g3; De Jong 135. 11 LUTHER, M. Das Windliecht Gottes. 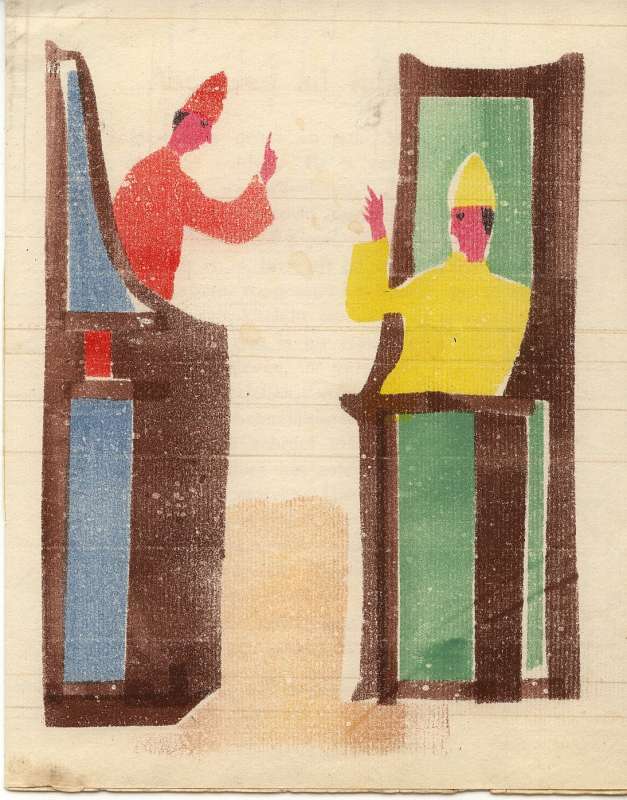 [Met "Aanteekening" door (with note by) f.r.a. henkels]. 1942. 278 x 200 mm. 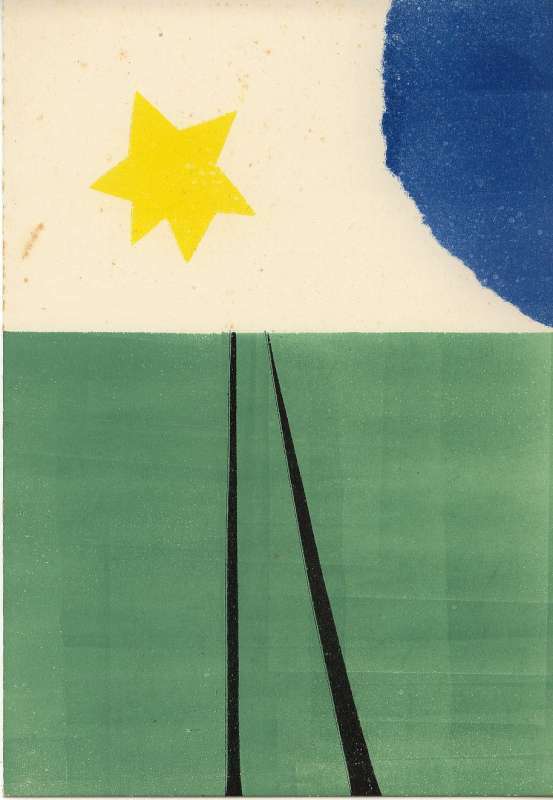 With "druksel" in 2 colours on front‑ and back cover. 4, 4 pp. * Edition 100 [ca. 150] copies. – Logboek pp. 32; Zuithoff pp. 42; Cat. Hot Printing 42-g4; De Jong 947. 12 HENKELS, F.R.A. Ballade van de bruiloftskinderen. [Ballad for the wedding children.] 1942. 225 x 205 mm. With "druksel" in 5 colours on front cover. 4, 4 pp. * Edition: 15 copies. – Logboek pp. 33; Zuithoff pp. 43; Cat. 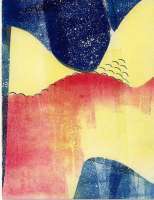 Hot Printing 42-g6; De Jong 60. 13 VERLAINE, Paul. Ballade van de twee olmen. [Ballade à propos de deux ormeaux qu'il avait]. Vertaald door (translated by) s. vestdijk. 1942. 371 x 252 mm. 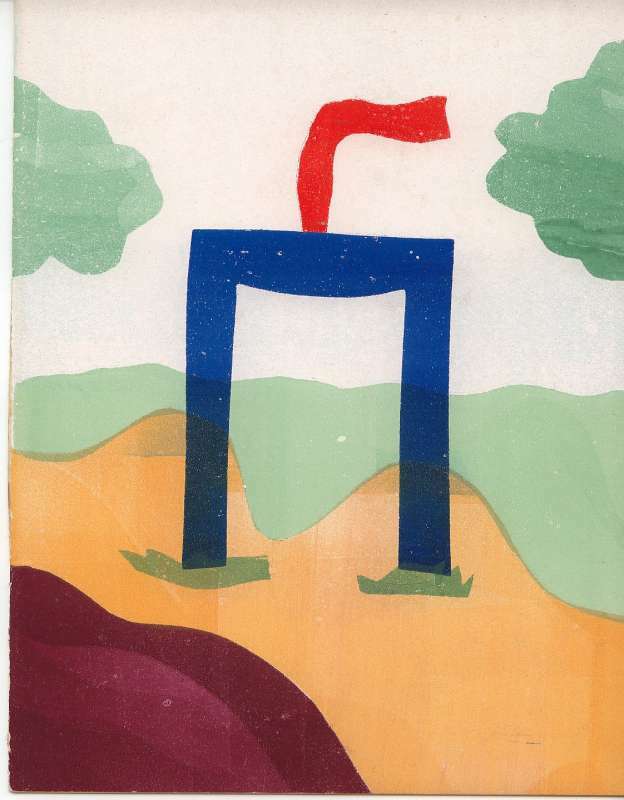 With "druksel" in 1 colour on front cover, "druksel" in 9 colours on pp. 1 and in 3 colours on pp. 2 and 3. 4, 4 pp. * Edition: 20 copies. – Logboek pp. 33; Zuithoff pp. 43; Cat. Hot Printing 42-g8; De Jong 65. 15 VRIES, Hendrik de. 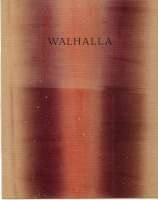 Walhalla. [Valhalla.] With vignet by hendrik de vries. 1942. 223 x 177 mm. With "druksel" on front cover. 4, 4 pp. * Edition: 75 [ca. 90] copies. – Inside very, very sl. foxed as usual. – Logboek pp. 35; Zuithoff pp. 44; Cat. 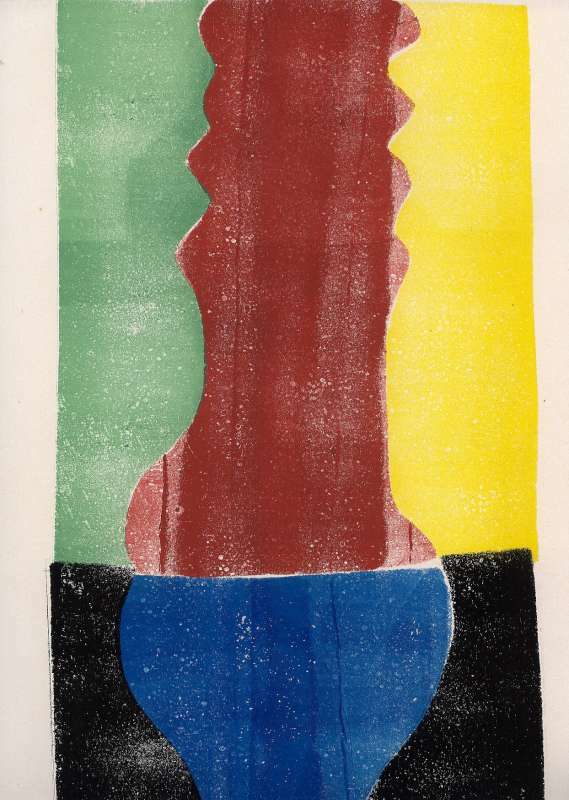 Hot Printing 42-g11; De Jong 926. 16 MARSMAN, H. De zee. [The sea.] 1942. 358 x 305 mm. With "druksel" in 2 colours on front cover and in 7 colours on pp. 1, 2, 3 and 4. 4, 4 pp. * Edition: 15 (= 12 ex.) copies. – One of the rarest and finest Blue Barge editions. – Logboek pp. 35; Zuithoff pp. 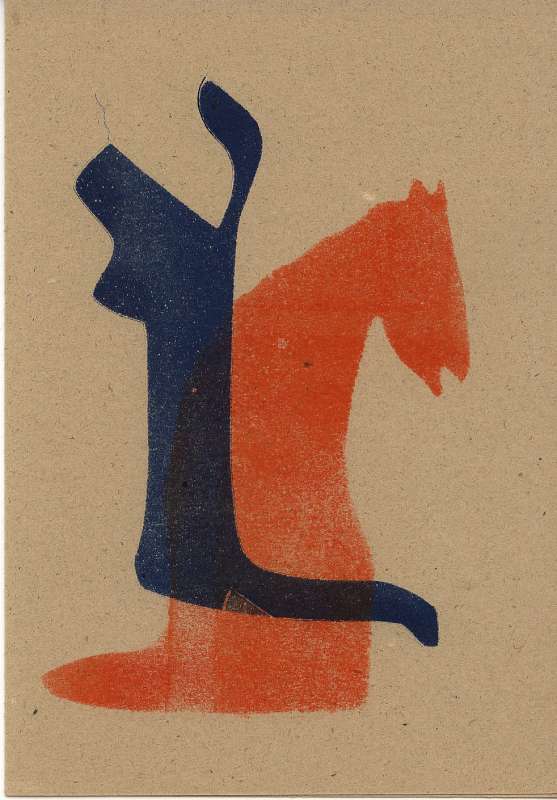 44; Cat Hot Printing 42-g10; De Jong 970. 17 HENKELS, F.R.A. en VESTDIJK, S. Ascensus ad inferos. 1942. 234 x 187 mm. 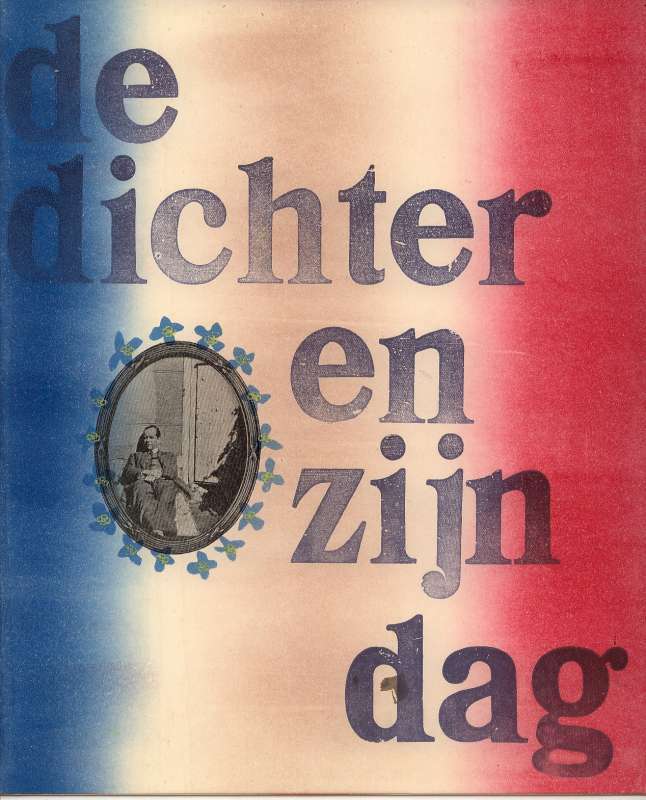 With "druksel" in 7 colours on front cover. 4, 4 pp. 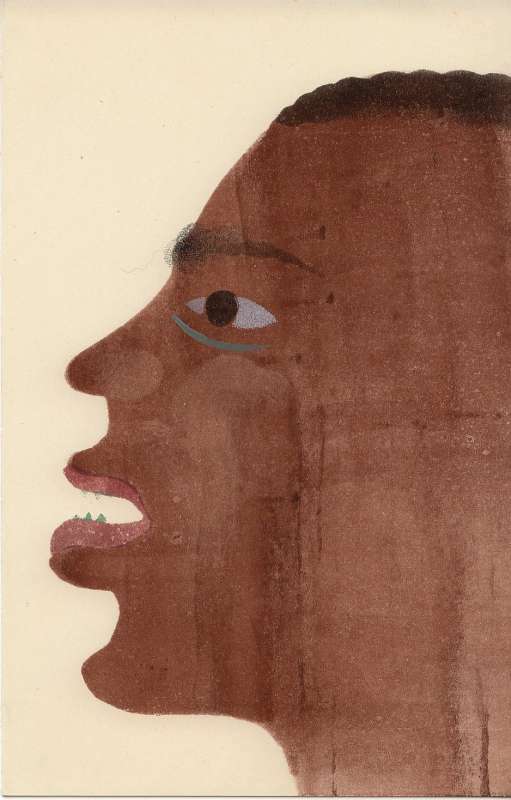 * Edition: 50 copies, printed on used 19th‑century paper from old archives. – Text printed in red. - Logboek pp. 36; Zuithoff pp. 45; Cat. Hot Printing 42-g13; De Jong 48. 18 HENKELS, F.R.A. Ballade voor Herbert. [Ballad for Herbert.] 1942. 288 x 225. mm. With "druksel" in 6 colours on front cover and 2 in resp. 2 and 5 colours inside. 4 pp. * Edition: 25 copies. – Logboek pp. 37; Zuithoff pp. 45; Cat. Hot Printing 42-g14; De Jong 62. 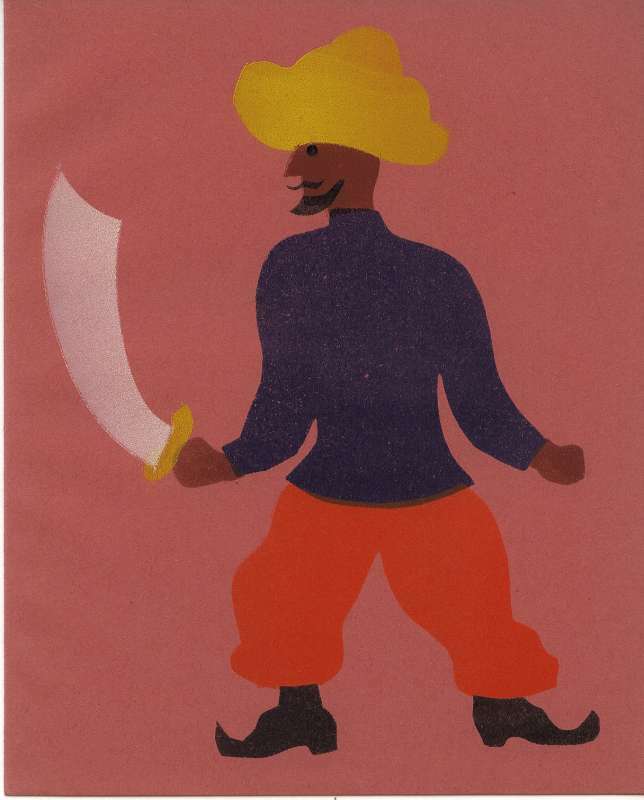 19 OSTAIJEN, Paul van. 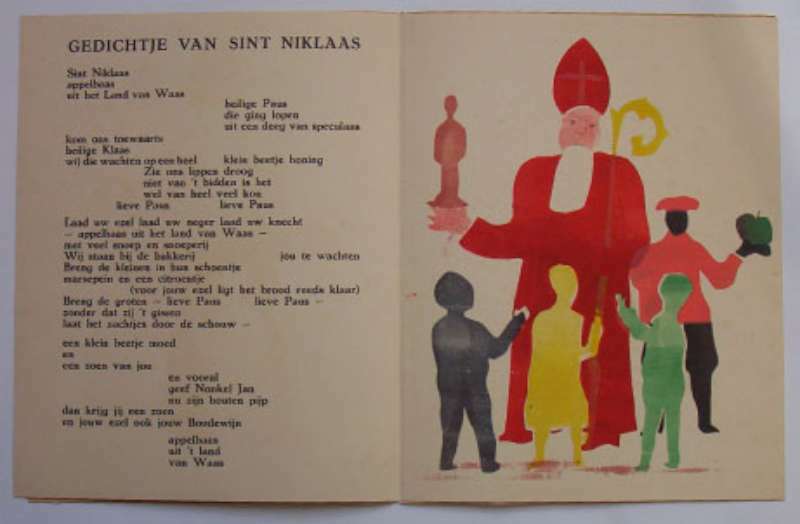 Gedichtje van Sint Niklaas. [Poem for St. Nicholas.] 1942. 325 x 258 mm. 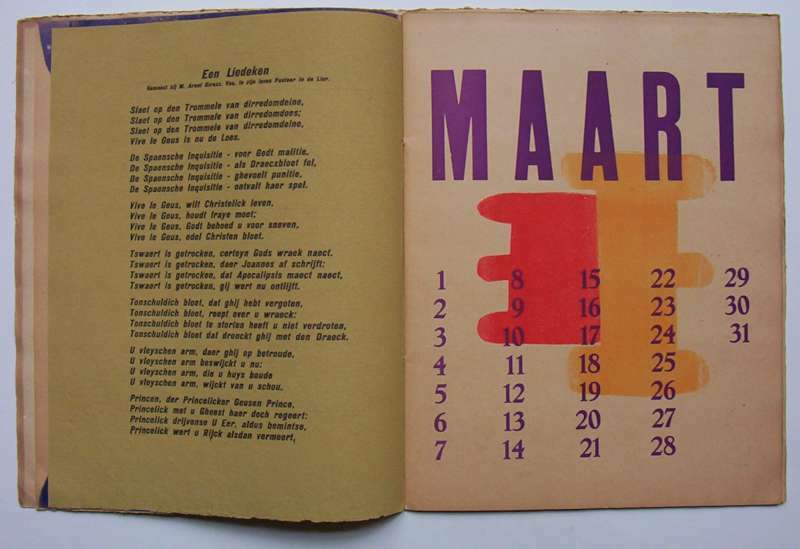 With "druksel" in 1 colour on front cover, in 7 colours on pp. 1 inside and in 8 colours on pp. 3. 4, 4 pp. * Edition: 20 copies. – Logboek pp. 37; Zuithoff pp. 45; Cat. Hot Printing 42-g15; De Jong 296. 20 NIJHOFF, M. Holland [en] In plaats van foto. [Holland / Instead of a photograph.] 1942. 325 x 250 mm. 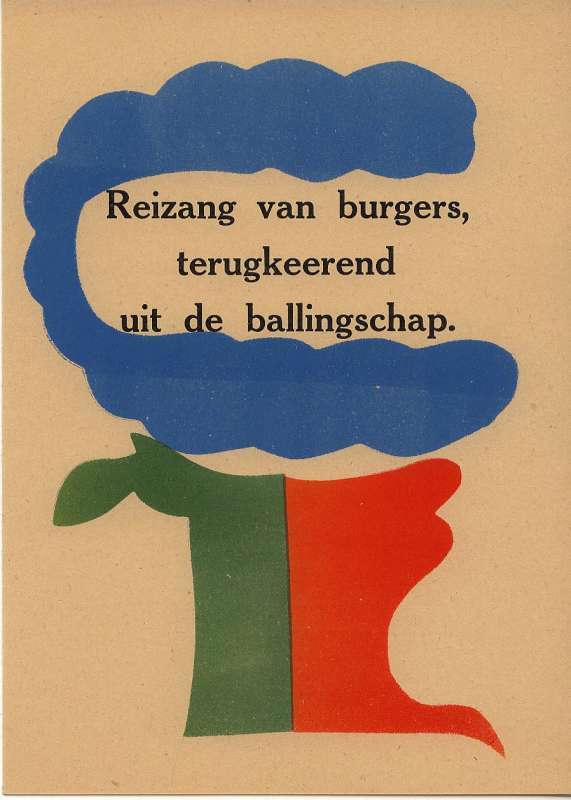 With "druksel" in 4 colours on front cover, in 2 colours inside cover, en two in 4 colours between the text. 4, 4 pp. * Edition: 120 copies. – Logboek pp. 38; Zuithoff pp. 45; Cat. Hot Printing 42-g17; De Jong 394. 21 PSALMEN. Übersetzt von martin buber. 1942. 266 x 165 mm. 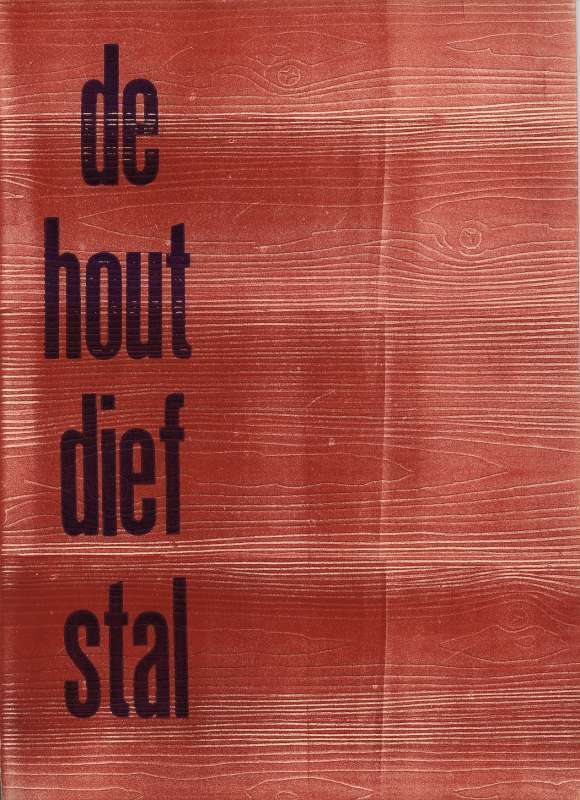 With "druksel" in 3 colours on front cover, one in 2 colours on pp. 2 inside and in 1 colour on pp. 7 inside. 4, 8 pp. * Edition: 75 copies. – Logboek pp. 38; Zuithoff pp. 45; Cat. 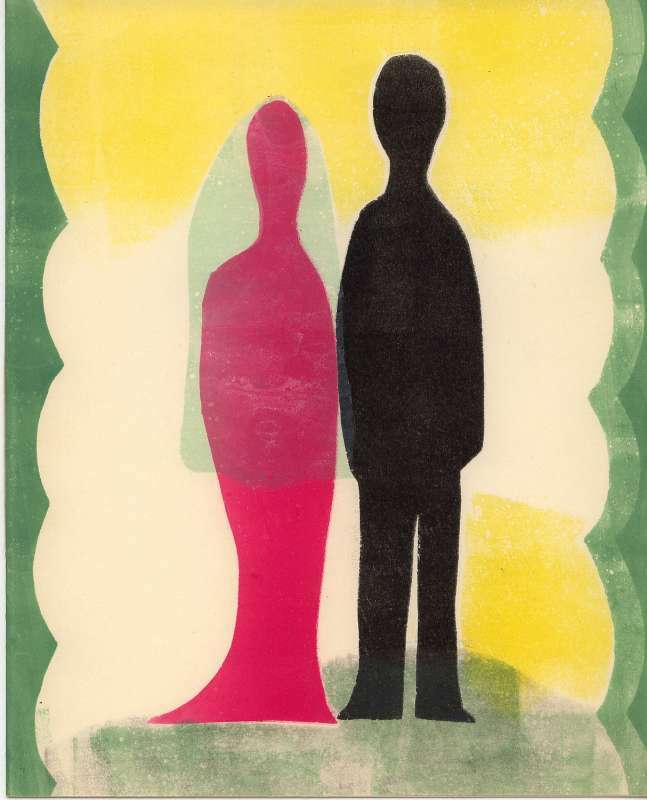 Hot Printing 42-g18; De Jong 682. 22 MARSMAN, H. Paul Robeson zingt. [Paul Robeson sings.] 1942. 248 x 160 mm. With "druksel" in 5 colours on front cover and in 2 colours inside. 4 pp. * Edition: 20 copies. – Logboek pp. 39; Zuithoff pp. 46; Cat. 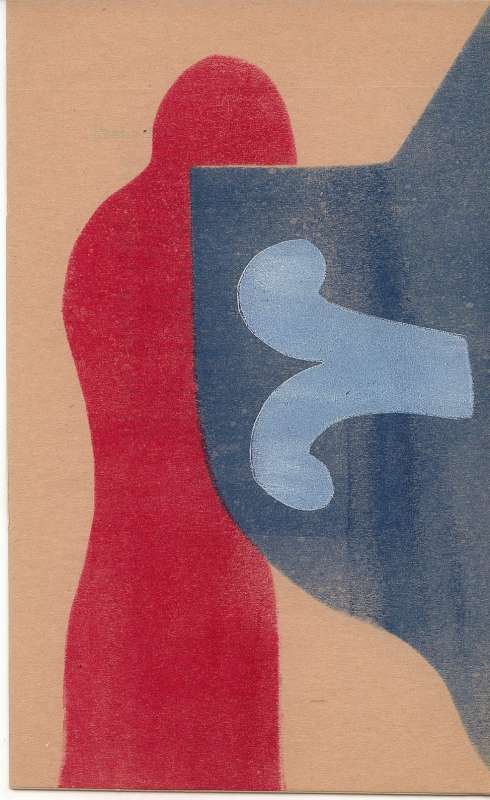 Hot Printing 42-g19; De Jong 644. 23 HENKELS, F.R.A. Kerstmis in Friesland. [Christmas in Friesland] 1943. 227 x 156. mm. With "druksel" in 4 colours on front cover and in 3 colours inside. 4 pp. * Edition: 250 copies. – Logboek pp. 39; Zuithoff pp. 55; Cat. Hot Printing 43-g1; De Jong 456. 24 BOUILHET, L.H. Soldat Libre. [Free soldier.] 1943. 240 x 167 mm. 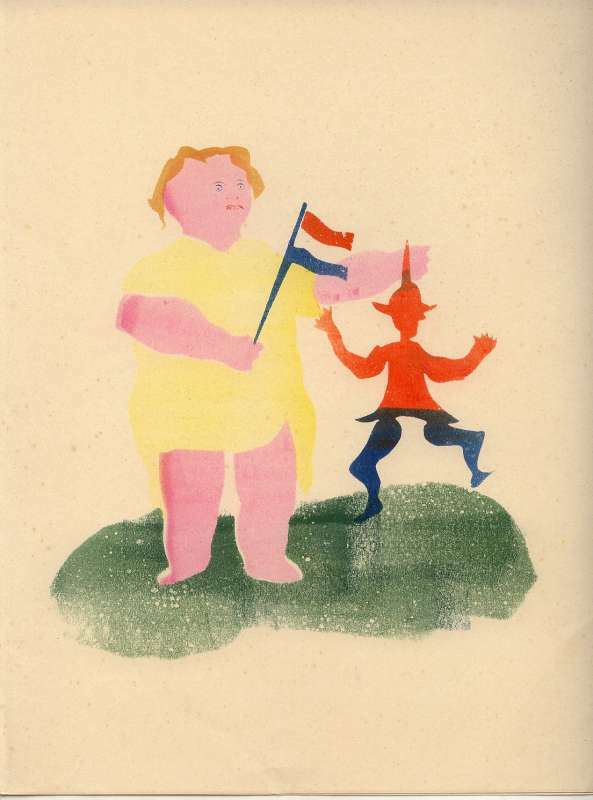 With "druksel" in 2 colours in front cover. 4 pp. * Edition: 75 copies. – Logboek pp. 39; Zuithoff pp. 55; Cat. Hot Printing 43-g3; De Jong 768. 25 NIJHOFF, M. Des Heilands tuin. Een Pinksterhymne. [The Saviour's Garden. A Hymn for Whit.] 1943. 320 x 217 mm. 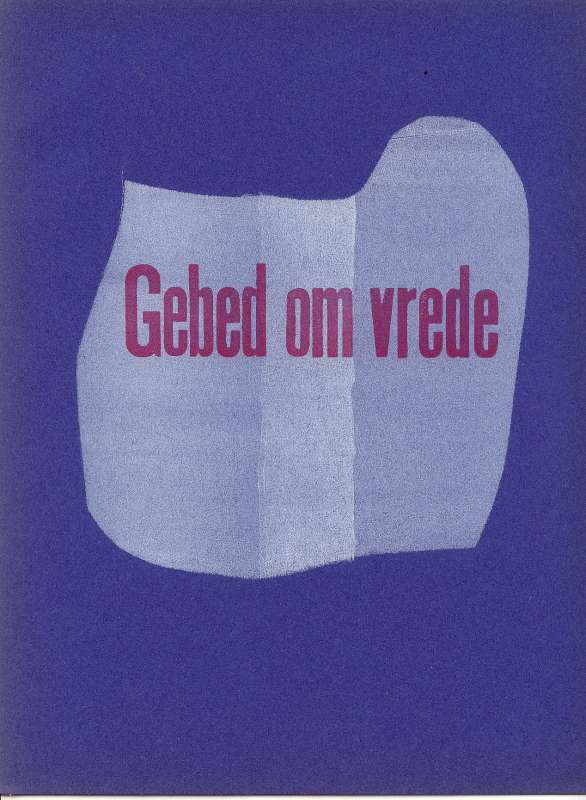 With "druksel" in blue on front cover and in 2 colours on pp. 1 inside. 4, 4 pp. * Edition: 75 copies. – Text printed in red and black. – Logboek pp. 40; Zuithoff pp. 56; Cat. Hot Printing 43-g4; De Jong 182. 26 HENKELS, F.R.A. Lied van de vergeten ooms. [Song for the forgotten uncles.] 1943. 350 x 252. mm. 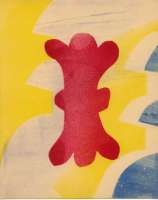 With "druksel" in 3 colours on front cover, in 2 colours on pp. 1 inside and in 2 colours on pp. 2 inside. 4, 16 pp. * Edition: 25 copies. – Logboek pp. 40; Zuithoff pp. 56; Cat. Hot Printing 43-g5; De Jong 510. 27 CHARLES d'ORLÉANS. Gebed om vrede [Priez pour paix, doulce Vierge Marie, Royne des cieulx et du monde maistresse]. 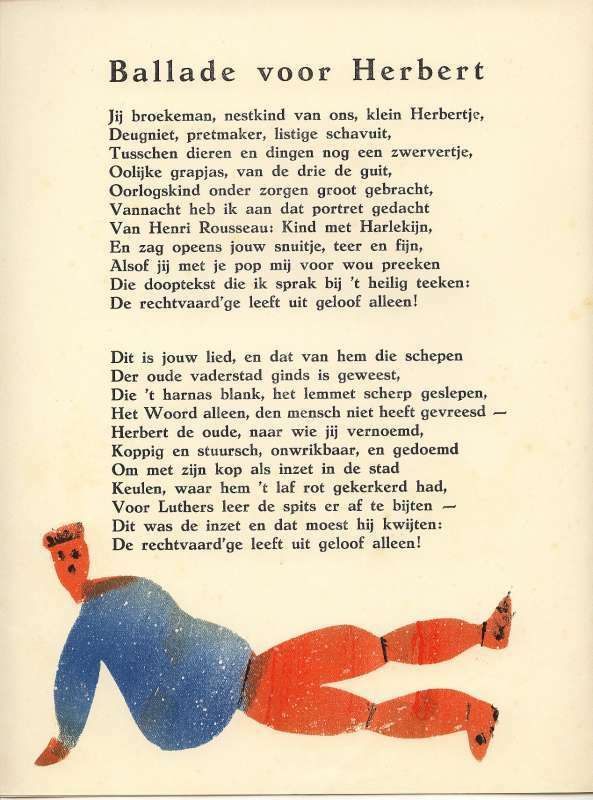 Vertaald door (translated by) m. nijhoff. 1943. 282 x 222 mm. With "druksel" in 2 colours on front cover and in 1 colour on pp. 1 inside. 4, 4 pp. * Edition: 75 copies. – Logboek pp. 40; Zuithoff pp. 57; Cat. Hot Printing 43-g6; De Jong 284. 28 LUTHER, M. Ein Gebet wider den Türken. 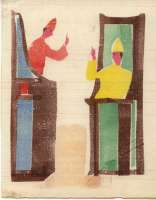 [Met "Aanteekening" door (with note by) f.r.a. henkels]. 1943. 255 x 206 mm. With "druksel" in 6 colours on front cover. 4, 4 pp. * Edition: 75 copies. – Logboek pp. 41; Zuithoff pp. 57; Cat. Hot Printing 43-g9; De Jong 286. 29 NIJHOFF, M. De grot. [The cave.] 1943. 239 x 166 mm. 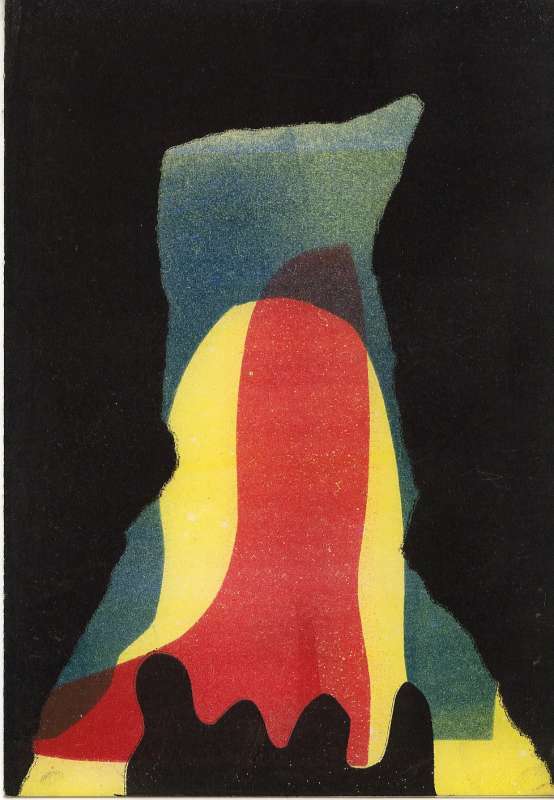 With "druksel" in 4 colours on front cover. 4 pp. * Edition: 75 ex. [ca. 40 copies destroyed]. – Logboek pp. 42; Zuithoff pp. 57; Cat. 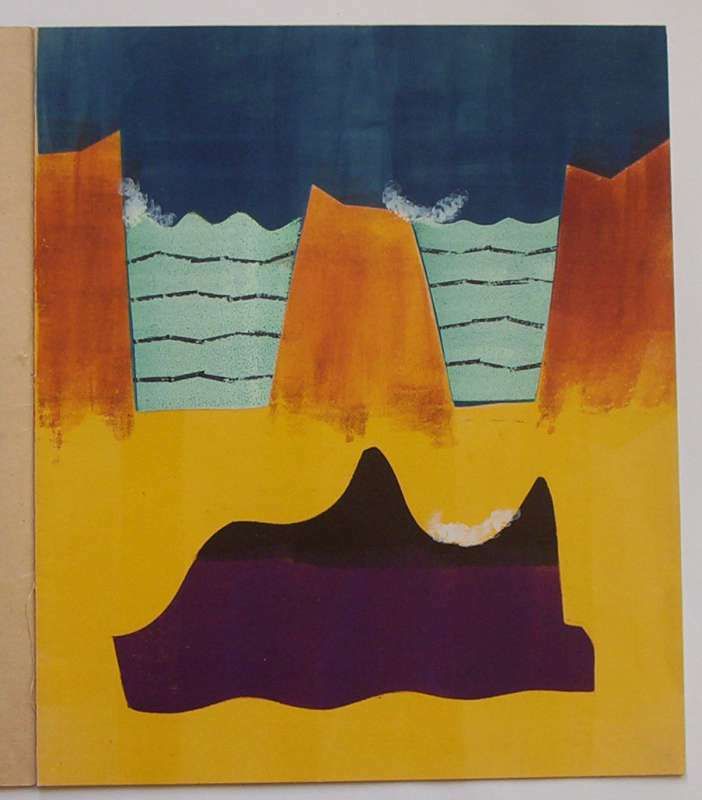 Hot Printing 43-g14; De Jong 347. 30 HENKELS, F.R.A. Ballade voor een gevangen dichter. [Ballad for an emprisoned poet.] 1943. 296 x 244 mm. With "druksel" in 5 colours on front cover and in 3 colours inside. 4 pp. * Edition: 30 copies. – Logboek pp. 42; Zuithoff pp. 58; Cat. Hot Printing 43-g12; De Jong 61. 31 VESTDIJK, S. De terugkomst. [The return.] 1943. 250 x 176 mm. With "druksel" in 5 colours on front cover and in 2 colours inside. 4 pp. *Edition: 25 copies. – Logboek pp. 43; Zuithoff pp. 58; Cat. Hot Printing 43-g13; De Jong 806. 32 HENKELS, F.R.A. 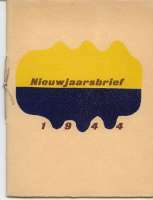 Nieuwjaarsbrief 1944. [New Year's Letter 1944.] 1943. 230 x 175 mm. 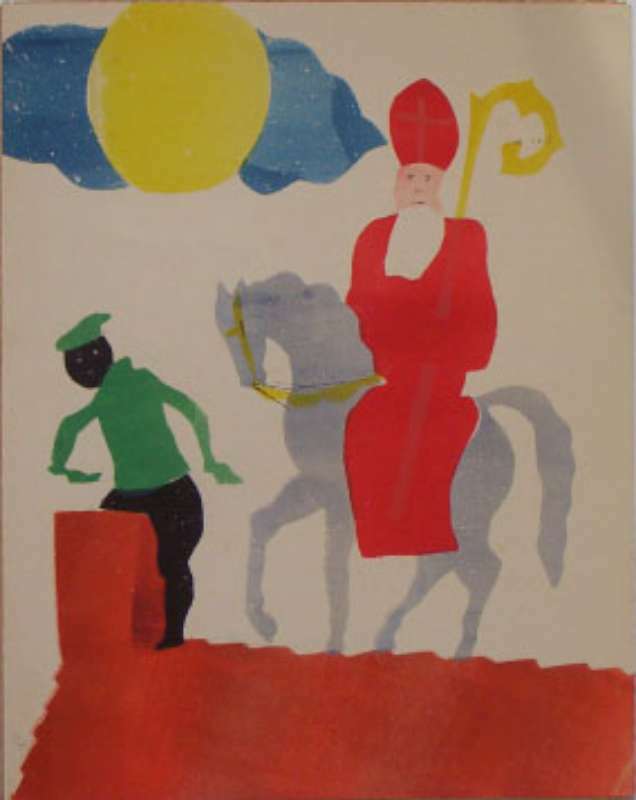 With "druksel" in 3 colours on front cover, in 7 colours on pp. 19 and a photograph tipped in. 4, 20 pp. *Edition: 30 copies. – Logboek pp. 43; Zuithoff pp. 58; Cat. Hot Printing 43-g19; De Jong 602. 34 HENKELS, F.R.A. en VESTDIJK, S. De Houtdiefstal. [The stealing of the wood.] 1944. 300 x 215 mm. With "druksel" in 2 colours on front cover and in 1 colour inside. 4, 4 pp. * Edition: 30 copies. – Logboek pp. 45; Zuithoff pp. 59; Cat. Hot Printing 44-g2; De Jong 403. 35 TRAKL, Georg. Menschheit. 1944. 348 x 260 mm. With "druksel" in brown on front cover. 4 pp. * Edition: 45 copies. – Copy with the portrait “en profil”. – Logboek pp. 47; Zuithoff pp. 60; Cat. Hot Printing 44-g3; De Jong 559. 35A TRAKL, Georg. Menschheit. 1944. 348 x 260 mm. With "druksel" in brown on front cover. 4 pp. * Edition: 45 copies. 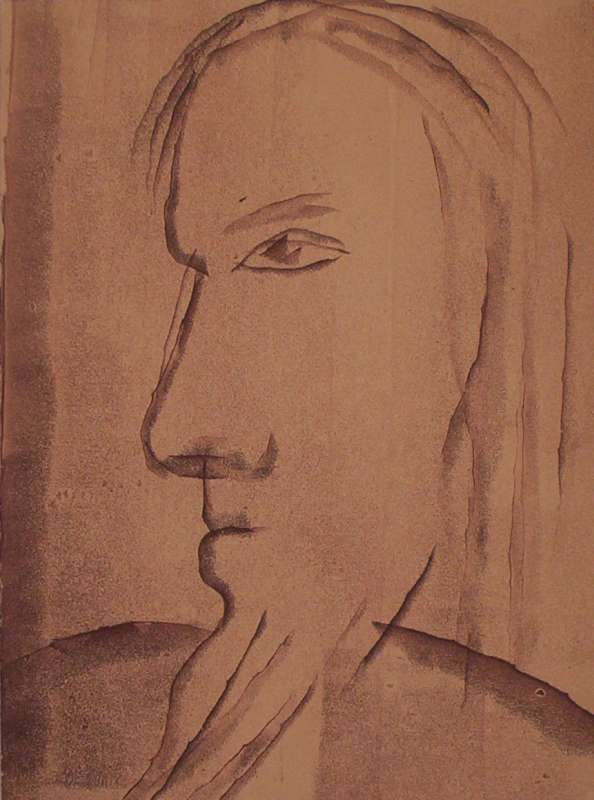 – Copy with the portrait “en face” [only a very few copies!]. – Logboek pp. 47; Zuithoff pp. 60; Cat. Hot Printing 44-g3; De Jong 559. 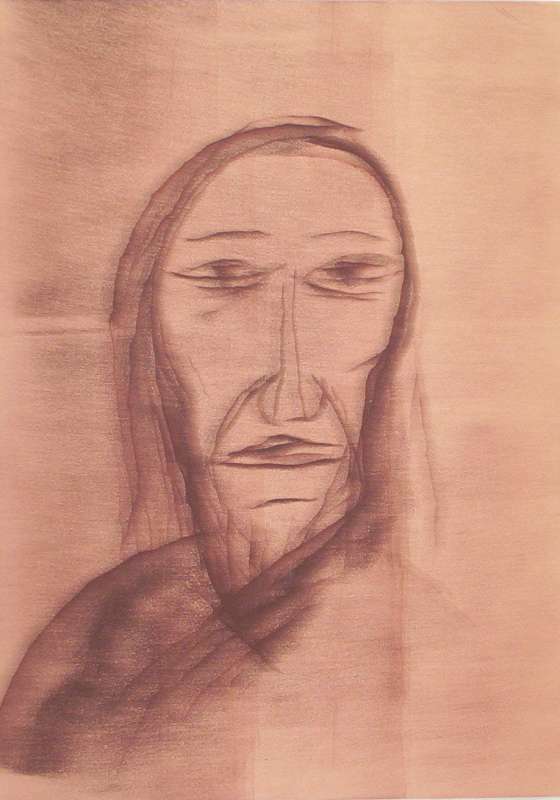 36 REVIUS, Jacob. Volherdinge. [Perseverance.] 1944. 210 x 164 mm. With "druksel" in 4 colours on front side. 4 pp. * Edition: 60 copies. – Logboek pp. 47; Zuithoff pp. 60; Cat. Hot Printing 44-g4; De Jong 889. 37 HENKELS, F.R.A. De dichter en zijn dag. [The poet and his day.] 1944. 260 x 220 mm. 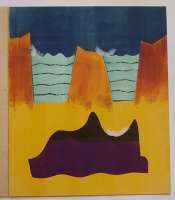 With "druksel" in 3 colours [surrounding a photograph of the Dutch poet M. Nijhoff] on front cover and in 1 colour on pp. 1 inside. 4, 4 pp. * Edition: 15 copies. – Logboek pp. 48; Zuithoff pp. 61; Cat. Hot Printing 44-g5; De Jong 184. 38 HEEROMA, K.H. 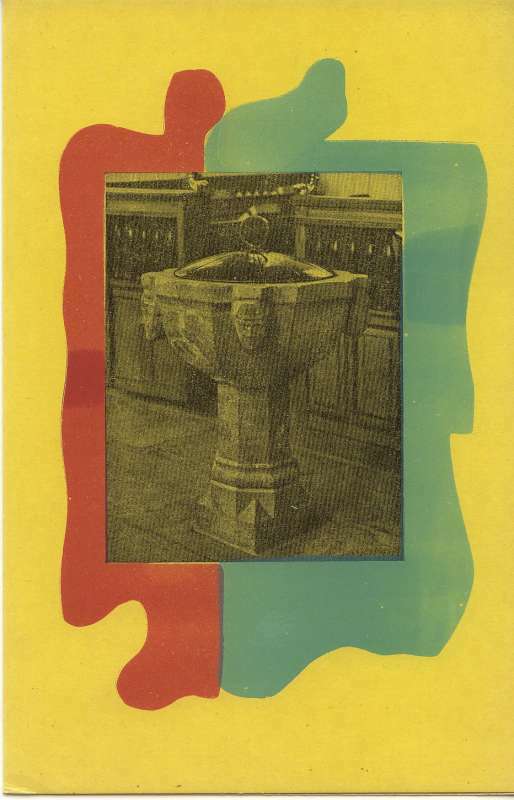 "Zo dikwijls als ik dwalend ..." [The Baptismal Font.] 1944. 247 x 159 mm. With "druksel" in green and red [surrounding a photograph of a baptismal font] and in red on pp. 1 inside. 4 pp. * Edition: 60 copies. – Logboek pp. 48; Zuithoff pp. 61; Cat. Hot Printing 44-g8; De Jong 978. 39 VESTDIJK, S. De doode zwaanen. 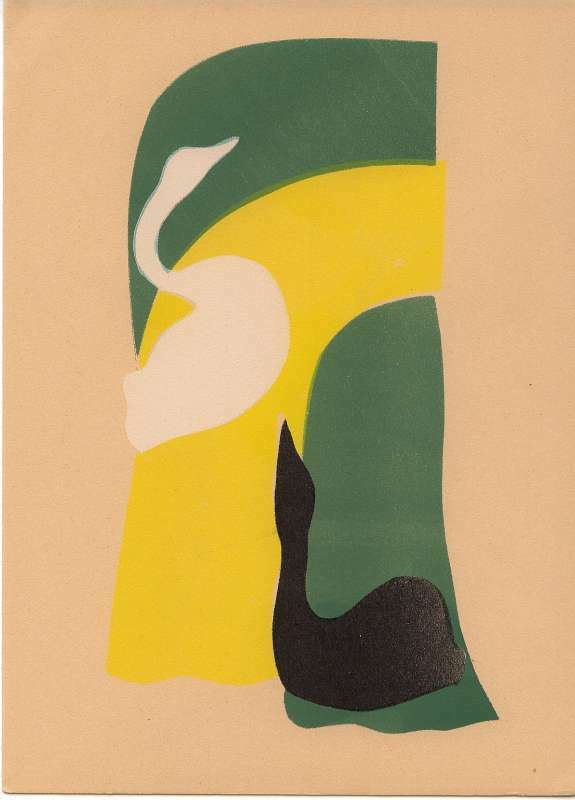 [The dead swans.] 1944. 280 x 203 mm. With "druksel" in 4 colours on front cover and in 2 colours on title page. 4, 4 pp. * Edition: 60 copies. – Logboek pp. 48; Zuithoff pp. 62; Cat. Hot Printing 44-g9; De Jong 199. 40 BOUTENS, P.C. Reizang van burgers terugkeerend uit de ballingschap. 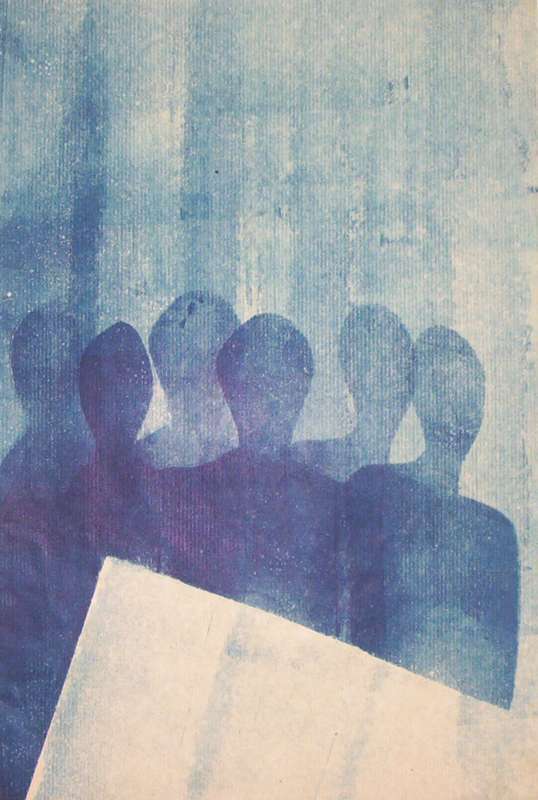 [Song for citizens returning from exile.] 1944. 213 x 154 mm. 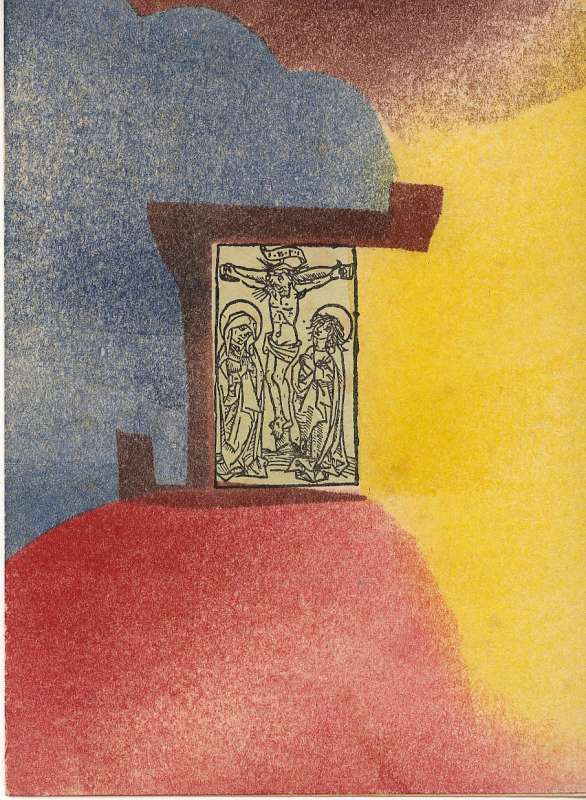 With "druksel" in 3 colours on front cover. 4 pp. * Edition: 90 copies. – Logboek pp. 48; Zuithoff pp. 62; Cat. 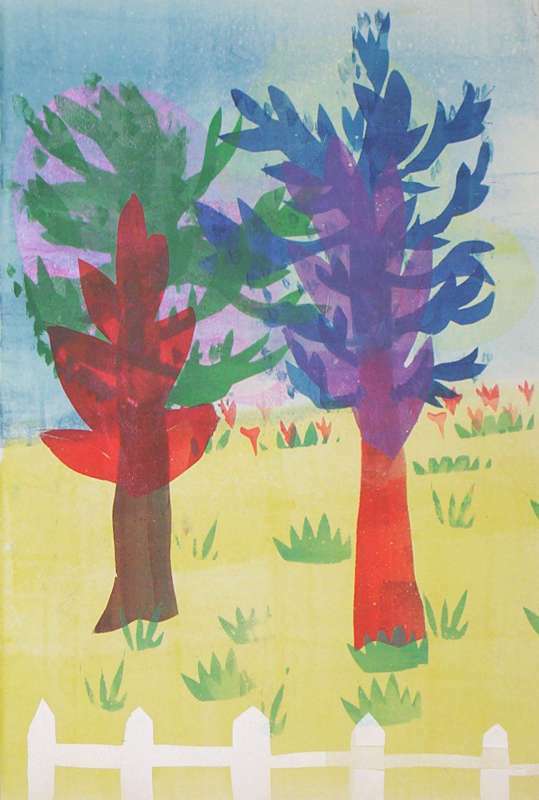 Hot Printing 44-g13; De Jong 691. GROTEN DER AARDE, LEVEND VOOR UW GLORIE. [Beloved, living in your pride.] 1944. 213 x 154 mm. 4 pp. * Edition: 50 copies. 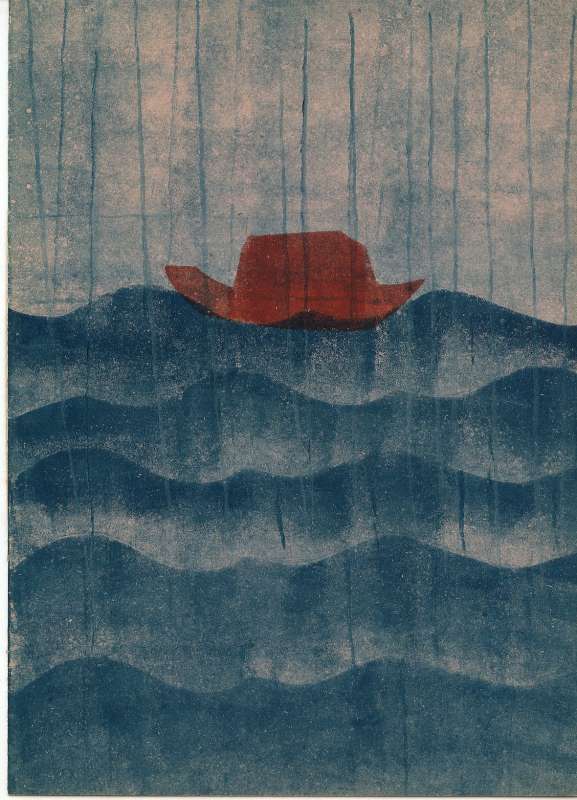 ‑ Not distributed; never published nor finished Blue Barge publication, because the cover never designed. – Not in Cat. Hot Printing.